The COE concept seeks to ensure that key councils are identified across the region and worked with very closely in their process of getting gender on their council’s agenda. The approach also seeks to develop synergy in GL programme work by focusing various projects from our SADC Gender Protocol, governance, media and justice programmes in specific localities. 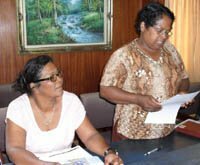 Read the Most significant Change Case Study, From Zero to Hero: Women in local government in Mauritius. Besides Local Council work, Gender Links Mauritius has also been actively working at National Government level to lobby for gender equality. Read more on the Political Dialogue conducted on 15th March 2018.